Japan's trade deficit quadrupled in March as export growth slowed and energy imports continued to rise. A weak Japanese currency, which pushed up the cost of imports, also contributed to the widening gap. The deficit rose to 1.45 trillion yen ($14bn; £8.4bn), up from 356.9bn yen during the same month a year ago. Japan's energy imports have been rising after it shut all its nuclear reactors in the aftermath of the earthquake and tsunami in 2011. According to the latest trade data, imports of Liquefied Petroleum Gas (LPG) rose more than 8% in March, compared to the same month last year. Meanwhile, imports of Liquefied Natural Gas (LNG) rose nearly 4%. And Japan is having to pay more for those imports after a series of aggressive policy moves aimed at spurring economic growth - including a huge boost to the country's money supply - have weakened the yen sharply. The Japanese currency fell nearly 10% against the US dollar between March 2013 and March this year. The latest figures show that while LPG imports rose 8.1% in volume during March, the value of those imports rose more than 18%. Similarly, the volume of LNG imports rose nearly 4%, while the value of those shipments jumped 14%. Japan's overall imports rose 18.1% in March, compared to a year ago, while exports rose at an annual rate of 1.8%. Some analysts suggested that Japan's recent sales tax hike also played a part in boosting imports during the month. The rise in the sales tax - also known as consumption tax - came into effect on 1 April. The sales tax has been increased to 8% from 5% and it will rise again, to 10%, in October 2015. Analysts said the hike had seen increased demand among Japanese consumers in March, as they looked to buy goods ahead of prices rising once it had been implemented. Marcel Thieliant, Japan economist at Capital Economics, said that looking ahead "consumers are likely to rein in spending in the wake of this month's consumption tax hike, which should reduce import demand". 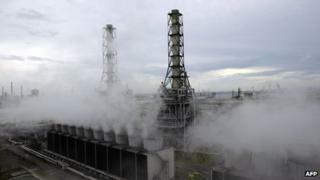 There has also been growing speculation that Japan is looking to restart some of its nuclear reactors. If that happens, such a move is likely to help reduce its energy imports as well as its trade deficit. "The trade shortfall is likely to narrow in the second quarter, which should provide some support to GDP growth even as domestic demand is set to plunge," Mr Thieliant said.